Overview of UVAG / Download "One-Pager"
The NSF-ARI CAVE Proposal The NSF Academic Research Infrastructure proposal was funded at $1.6M. Comments from Ron Kriz (Contact for Scientific Applications and NCSA liaison), rkriz@vt.edu. Comments from Debby Hix (Contact for Human Computer Interaction Applications), hix@vt.edu. 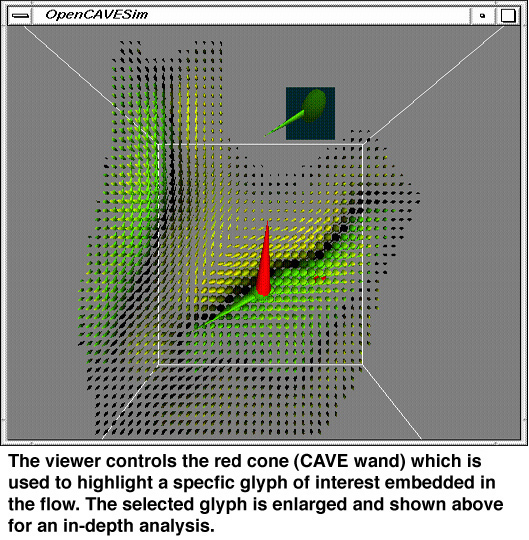 Off-Campus Partnerships: NCSA / EVL: The CAVE(tm) proposal was written prior to the PACI proposal in partnership with NCSA as part of the University Visualization Group of the ACITC. This ACITC resource was setup to benefit both on- and off-campus: NCSA's VR-Developers Grid / EVL's Tele-Immersion SC98. 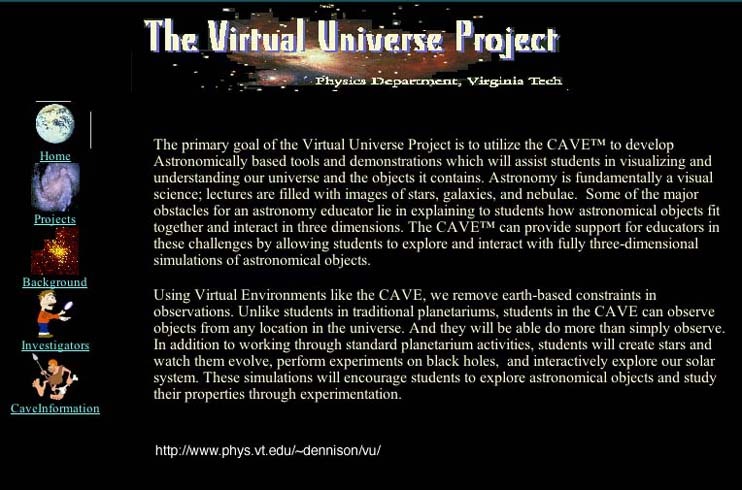 There are other proposals related to the CAVE(tm) proposal, also in partnership with NCSA: K-12 / Distance Learning: The Central Virginia Governors School ( CVGS) has worked with the Laboratory for Scientific Visual Analysis on developing a web based K-12 educational project called DIGSTATS. Dr. Tom Morgan, Director of CVGS, and Dr. Ron Kriz, VT-CAVE Director, submitted a proposal, " Extending the Use of Collaborative Virtual Environments for Instruction to K-12 Schools ", to SiliconGraphics Inc and Virginia Tech's Institute for Connecting Science Research to the Classroom (ICSRC). This proposal was accepted and will use EVL's LIMBO together with the PACI CAVE Collaborative Console (CCC) project to create a collaborative learning environment between Governors Schools in Virignia. First VRML and CCC Training Session for govern schools instructors was on June 17 and 18, 1999. Our group demonstrated CCC at the NCSA Access Center, November 17, 1999. Progress Report and Position Paper on CCC, January 16, 2000. Results of this K-12 project includes CVGS CCC web-pages that describe lesson plans and link to presentations at the TILT (2000) and VAST (2000) conferences. DIGSTATS, TILT, and K12 CAVE related projects are support by the Institute for Connecting Research and Science to the Classroom. A paper "Extending the Use of Collaborative Virtual Environments for Instruction to K-12 Schools" provides a more complete description of this project which was published in the Journal "Insight " and sponsored by the Institute for the Advancement of Emerginig Technologies in Education (IAETE). IAETE also sponsored Think Quest Live Event: Exploring the Future of Learning where Professor John Wenrich and Ron Kriz demonstrated CCC in realtime as part of the thinkquestlive program on advanced networks / Internet2 pavilion: "My Teacher's an Avatar". A summary of this project was featured in the VT-news article The UVAG lab resources were also used by the Roanoke County Schools Externship Program, where Arvind Chavali, a senior at CAVE Springs H.S., used the CAVE for his senior project, "Visualization of AutoCAD Model Cell Structure in CAVE Immersive Enironments"
On-Campus Partnerships: RDF-VELab / IDFL / CMSMS / BioChem / etc. Architecture and Urban Studies ( RDF-VELab): --> Dennis Jones & Bob Schubert. We are investigating intermetallic alloys in order to develop new structural materials for high temperature applications. The goal is to develop new alloys with increased strength and ductility. NiAl is a prime candidate and we are simulating the behavior of cracks propagating in this material. The phenomena that occur at the crack tip are three dimensional in nature and the CAVE visulazation will help researchers and students understand the mechanisms of fracture in order to design materials with improved ductility. Using AtomView in CAVE allows us to virtually walk around the atoms at the critical region of the crack tip. Recently we have combined AtomView with the CAVE Collaborative Console (CCC) and created CCC_atom where researchers can collaborate by sharing views, analyzing and interpreting results of their supercomputer simulations at their desktop workstations or in an immersive environment of a CAVE. 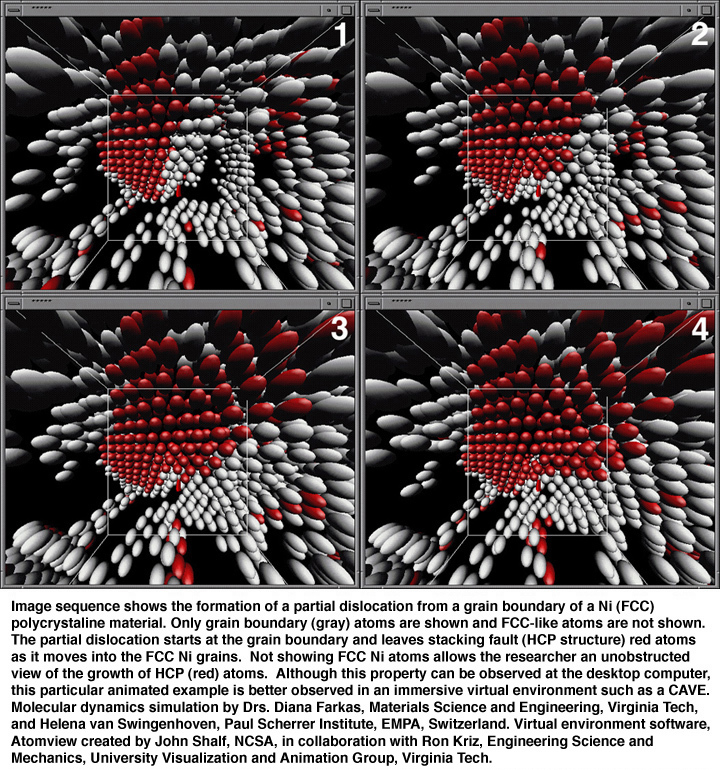 AtomView has been used in a collaboration between Virginia Tech & Paul Scherrer Institute where the CAVE is used to study the formation of partial dislocations from grain boundaries in a Ni polycrystal. With the System-X tera-scale computer at Virginia Tech, the UVAG has created a "real-time" "computational-steering" Atomview application. Co-Investigators: Lennie Scott-Weber, Anna Marshall-Baker, Eric Wiedegreen, Jeanette Bowker, and Bob Parsons. We have researched computer simulation including modeling, rendering, animation, and virtual reality (VR) as potential methods to improve the interior design process. Simulation early in the design process can detect errors in design including those that cause physical or psychological harm. Unlike most VR equipment which generates low resolution images, the CAVE provides a high-resolution virtual environment which is ideal for testing detailed designs. The CAVE could be used for virtual prototyping of interior components or entire environments. Our particular interests are in simulating designs for environments that coincide with the research expertise of the investigators. These include design for elderly (e.g. assisted living, nursing homes), neonatal units in hospitals, educational facilities, and office environments. NCSA hosted a Visual Supercomputer Institute where professors Joan McLain-Kark, Dennis Jones, and Ron Kriz worked on a team project to convert AutoDesk 3DStudio files into a CAVE walk thru. Some images below provide a summary of this team project. The original AutoDesk model was created by Jongran Lee, HIDM Department, as part of her Ph.D. dissertation: "Comparing the Effectiveness of Computer Simulation on Computer Monitor vs. Virtual Reality as Communication Tools in Interior Design"
Below are other models and renderings done by students in the Advanced CAD class taught by Joan McLain-Kark spring 1997. These were done in 10-12 hours using 3D Studio software by Autodesk. These models can also be brought into the CAVE where 6-8 people can be "immersed" in the environment or feel very close to experiencing the actual environment. RDF VELab Co-Investigators: John Dicky, Jim Jones, Robert Schubert, Mike O'Brein, Mehdi Setareh, Brian Squibb, Wallid Thabet. Cybercore History Project: Select Modules / Monastic Architecture Between Cluny and Citeaux : Paul Tavernise, Project Manager. 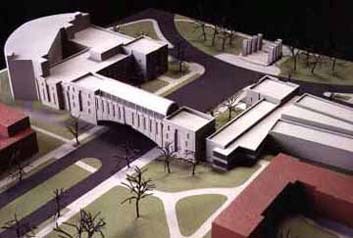 The College of Architecture and Urban Studies has completed numerous CAVE related projects. Please contact Professor Dennis Jones for details. The project featured here was a student project. The cathedral at Cluny France that was destroyed in the French revlolution was the largest and perhaps the most magnificant cathedral in Europe. The images below capture some of the views a visitor would see while walking thru the cathedral. The experimental investigation and analysis of complex vortical flows has always been a very tedious task. The level of complexity increases significantly in the case of spatio-temporally developing flows that involve the interaction of vortices and deformable walls (moving boundary conditions). These types of flows exist in cardio-vascular systems, e.g. 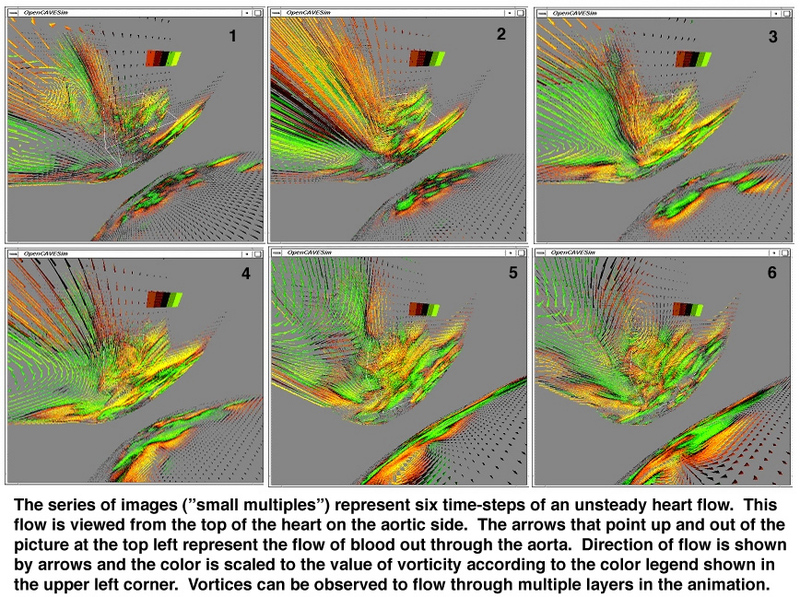 flow through a mechanical heart valve inside the heart's left ventricle. The analysis of such complex systems require a powerfull and adaptive scientific visualization envrionemnt, such as an interactive immersive virtual environment. 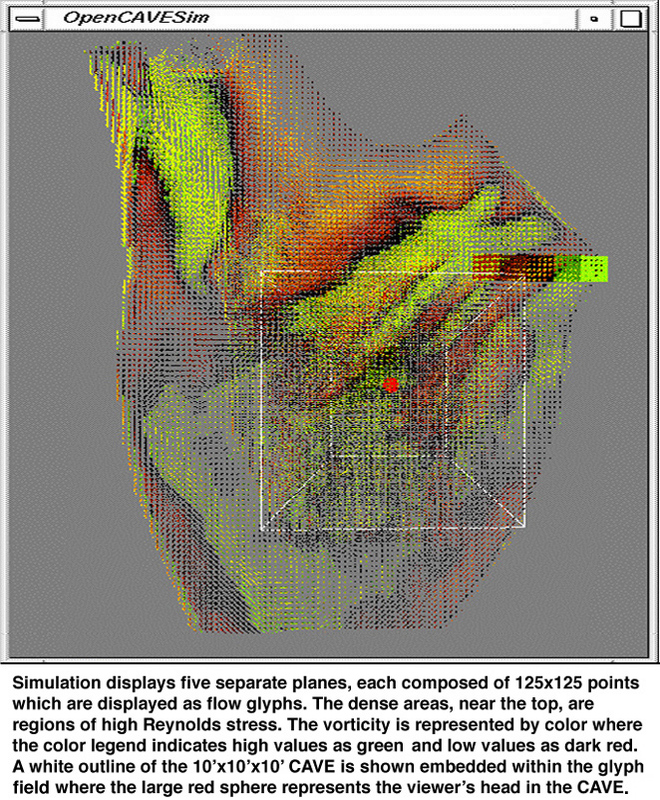 This research is the result of Mr. Ali Etebari's Masters Thesis: " Development of a Virtual Scientific Visualization Environment for the Analysis of Complex Flows", Engineering Science and Mechanics, Virginia Tech, Blacksburg, Virginia, November 15, 2002. Download various documents (powerpoint wall poster, BED publication, and publications in progress).